Simple Industrial Safety provides industrial safety equipment online. 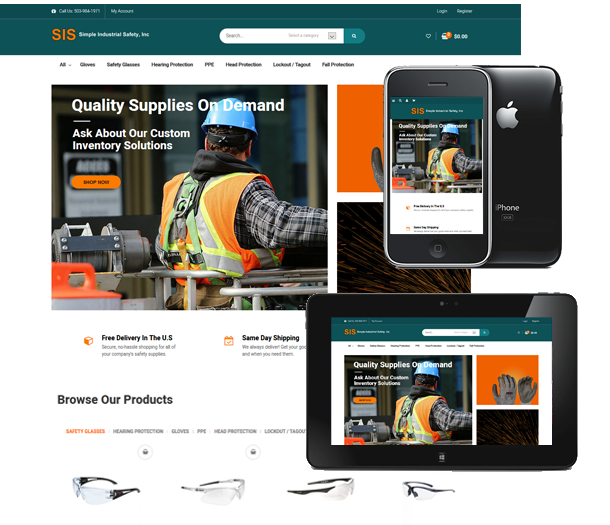 President, Simple Industrial Safety, Inc.
SimpleIndustrialSafety.com provides construction and industrial work safety goods like gloves, glasses, and fall protection equipment to contractors and large companies. Working alongside Simple Industrial Supply, Protocol Three constructed a framework for an online platform capable of not only processing orders, but also capable of streamlining a detailed Purchase Order process required by existing customers to ensure orders are not only paid for, but integrated with Quickbooks for accounting purposes. In just ten weeks from concept to completion, Simple Industrial Supply is now about to serve their customers, old and new, through their website, and utilizing all of the same internal accounting management software they they are used to. The online store is built on the customizable and easy to use Woocommerce shopping cart platform. We proudly continue to support Simple Industrial Supply in their endeavors with maintenance, management, ongoing support, and training when requested.